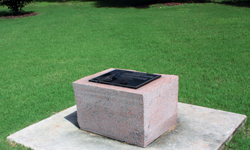 A bronze plaque set in a granite base commemorates the wreck of the space shuttle Columbia, which broke apart on reentry over Texas on February 1, 2003. 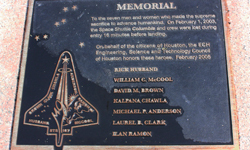 The plaque states the names of the crewmembers and has a replica of the patch of Shuttle Mission STS-107. Seven stars are depicted around the patch. It was dedicated in 2003.